Here's the latest version. I've got all of the grades to 3.2% or less according to XTrackCAd, and distances between the tops of the rails for crossings to about 3.8" or so. I moved the curved turnout going counter-clockwise into the blue yard closer to the yard, which got me a about 8.625" extra of horizontal travel at grade before the switch, and I made the grade a little steeper going counter-clockwise out of the green station and down the purple descent. With all of these colors and lines, it really feels like a rapid transit system! I've got a little bit of an unrelated project to do with some 1/4" plywood, so I'll have some extras to try layering two pieces, staggering the joints, seeing how it holds up. If that experiment fails, I'll follow the conventional method you talked about, Rick. Thanks for your advice! Cheers! Not being critical here - I know exactly what you mean - but I am amused that a measurement to a thousandth of an inch would be considered "about"
...I am amused that a measurement to a thousandth of an inch would be considered "about"
I was very precise, but I don't think I was very accurate! Now that you point it out to me, I am amused as well! I've made one more change to allow a longer station and passing opportunity on the elevated station. There are two curved turnouts going counterclockwise going "eastbound" or counter-clockwise. No more changes! Here are a few pictures of one station I'm drawing inspiration from. What kind of traffic are these stations made for? That last photo doesn't look real at all. Honestly it looks like some cheap plastic unpainted models. The stations in the pictures are the LIRR and NYC subway stations at Woodside. 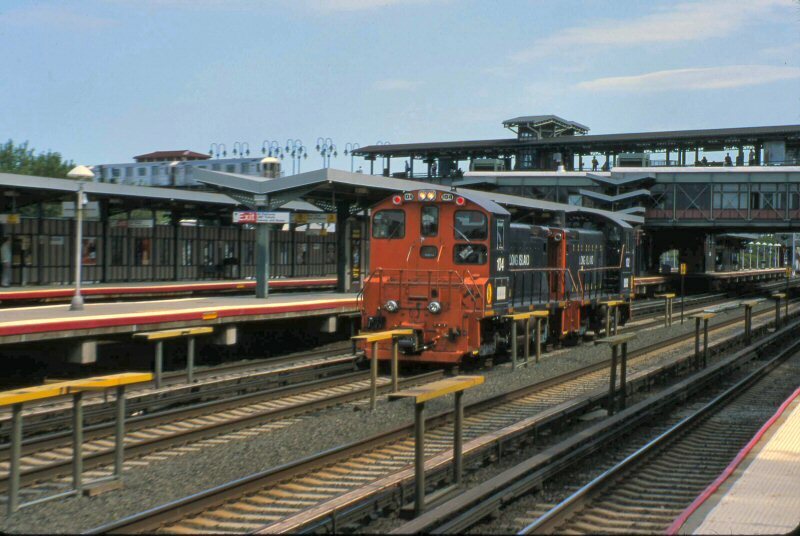 The LIRR station sees single-level electric MU trains and diesel and electric locomotive bi-level push-pull passenger cars. The subway station sees rapid transit cars. Neither sees freight, though both have work trains. On the layout, both will see rapid transit and 40'-55' freight pulled by 4-axel diesel locomotives, plus whatever other random equipment manages to find its way in. 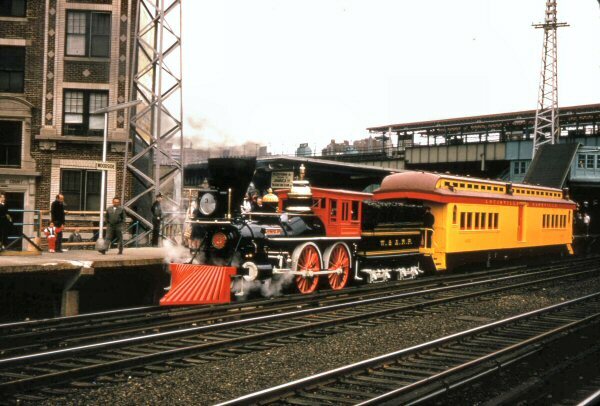 The Ye Olde locomotive was being brought in for the 1964 World's Fair. It does look like a fake, Rick. It would be a pretty fun conspiracy, though, since I think there's enough info on the interwebs to make it seem legit. Thanks for the explanation Don. Another curiosity what are those yellow things between tracks? The yellow things, as best as I know, can be used to get passengers off of trains that are in the middle tracks. I'm not sure how they would do that, but I think it would involve lining up a train with the same types of cars on an adjacent track. They haven't used them that I've heard of since I've been paying attention to real railroad stuff, which is about five years.